On Sunday, the Brooklyn Nets rallied from 10 points down in the final minute only to watch Lou Williams rip their hearts out with a 28-foot buzzer beater in a 119-116 loss to the Los Angeles Clippers. On Tuesday they finished the job. And what a job it was. The Kings led the Nets 103-78 through three quarters in Sacramento in what looked like a blowout on top of heartbreak for the Nets. 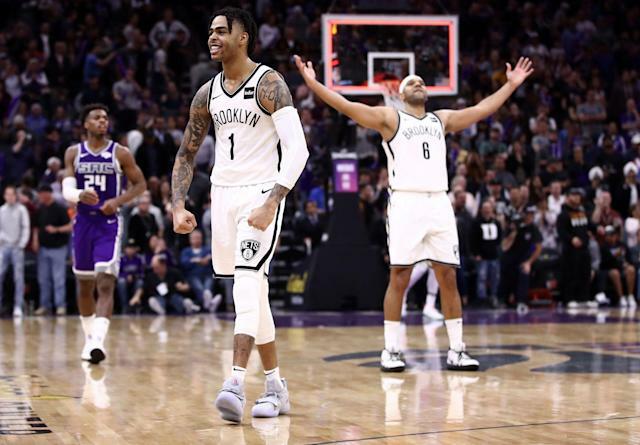 But D’Angelo Russell led the Nets in a massive fourth-quarter rally that saw Brooklyn outscore Sacramento, 45-18 in the final stanza to complete a stunning comeback capped by Rondae Hollis-Jefferson’s game-winning layup with 0.8 seconds remaining. Russell scored 27 of his game-high and career-high 44 points in the final quarter to go with 12 assists and 4 rebounds in the 123-121 win. The rally from a 28-point third-quarter deficit was the largest in Nets history. “I’m built for this s—-,” Russell proclaimed as he celebrated the victory on Sacramento’s court. With the win, the Nets increased their lead over the Miami Heat for seventh place in the East to 1.5 games while remaining 3 games ahead of the Orlando Magic, who sit in ninth place outside the playoff picture. The Kings dropped further out of the playoff race, seven game behind the Los Angeles Clippers, who are in 8th place in the Western Conference.